Santa Barbara Bed and Breakfast, the The Bayberry Inn. 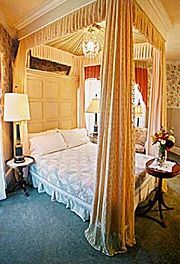 Experience Santa Barbara in one of the city's historic houses - now an elegant bed and breakfast inn. 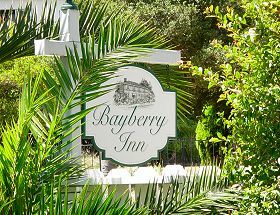 Designated a Structure of Merit by the Santa Barbara Landmarks Commission, The Bayberry Inn is nestled on almost half an acre, in a quiet residential neighborhood just blocks from the heart of downtown. All of the Bayberry's nine rooms feature queen-sized canopy beds and private baths. Some rooms feature private decks, fireplaces, antique claw-foot bathtubs or personal whirlpool tubs. Start each day with a full gourmet breakfast. Afterwards, relax in your own corner of our garden, or take an easy walk to shopping, restaurants, theatres and museums. The historic courthouse, the old Spanish Mission, and the Presidio are just blocks away. We serve a selection of local wines and cheeses daily between 4 and 6, and every night guests will enjoy one of the homemade desserts in our tearoom. This and other Santa Barbara Bed and Breakfast Inns can be found here online in The Register.